In this study, the feasibility of using oil palm trunk wastes for producing cross laminated timber (CLT) for building construction was evaluated. The small size three-layer CLT panels were manufactured using melamine urea formaldehyde adhesive as bonding between the lumber layers. 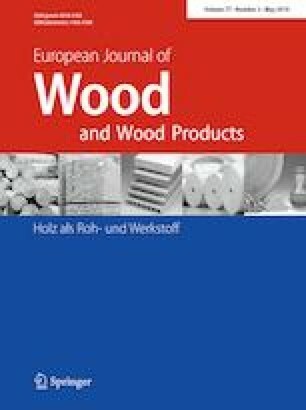 Effects of oil palm wood density and the controlled strain levels of the panel during pressing on the properties of the obtained CLT panels were investigated. Panel thickness (Pt), density (ρ), water absorption (WA), thickness swelling (TS), bonding strength (BS), compressive strength (Fc0) and modulus (Ec0) parallel to the major strength direction, compressive strength (Fc90) and modulus (Ec90) perpendicular to the flat plane and rolling shear strength (RS) of the produced CLT panels were measured. The result showed that oil palm wood density and the controlled strain level had noticeable effect on the properties of the obtained CLT panels. Using high controlled strain level of up to 20.8% and density oil palm wood to produce CLT panels gave better dimensional stability and mechanical properties for the final product but it resulted in an increasing of panel density. Thickness of the produced CLT panels decreased with increasing the controlled strain level during pressing. In view of mechanical properties, Fc0 of CLT made of high-density oil palm wood and all obtained BS met the requirement of the standard CLT but the others were much below. However, the calculation revealed that its application to low-rise building construction seemed to be possible. This work was supported by the Thailand Research Fund through the Royal Golden Jubilee Advanced Programme (Contract no. RAP60K0017). The authors would also like to thank AICA Co., Ltd., Songkhla, Thailand for providing MUF adhesives and the Research Center of Excellent on Wood Science and Engineering, School of Engineering and Resources, Walailak University, Thailand for providing facilities for experimental work.